The IRIDEX team invites you to attend a lunchtime symposium titled "MicroPulse® Technology Revolutionizes Cyclophotocoagulation" at the European Society of Cataract and Refractive Surgeons (ESCRS) Congress in Lisbon, Portugal on October 7, 2017 from 13:00 - 14:00 (room 4.6). We look forward to seeing you there! IRIDEX continues to grow! We have opened an office in Germany, making it easier for local physicians and practices to purchase equipment and seek technical support. Starting this month, a dedicated German team is available to provide direct sales, technical support, and global product knowledge. Additionally, we will be attending the DOG Congress at the Estrel Convention Center in Berlin on 28 September - 1 October. We invite you to stop by our booth (F1.01) for more information and to get hands-on demonstrations of our retinal and glaucoma lasers. The award-winning series, Innovations with Ed Begley Jr., will feature IRIDEX technology in an episode scheduled to air winter of 2018 on FOX Business. In this episode, the show will explore IRIDEX's patented MicroPulse® Laser Technology; a tissue-sparing solution for the treatment of retinal diseases and glaucoma, and IRIDEX's latest laser, the CYCLO G6™ Glaucoma Laser. An article by Dr. Nisha Chadha published on the September issue of Cataract & Refractive Surgery Today about "New Laser Therapies for Glaucoma" concluded that "Laser treatments are valuable, non-incisional options for glaucoma management, and that MicroPulse Technology (only from IRIDEX) offers a novel means of laser delivery that has been shown to be safe and effective." The Cyclo G6 continues to make an impact worldwide. In Brazil, Dr. Francisco Lima and Dr. Vital Paulino Costa, both ex-presidents of the Brazilian glaucoma society, shared their experience with treating glaucoma with MicroPulse® Therapy and the Cyclo G6™ Glaucoma Laser to a wide audience of Brazilian physicians attending the Brazilian Congress of Ophthalmology. In Indonesia, Dr. Astrianda gave a similar presentation to physicians attending the Indonesian Annual Ophthalmologists Congress. In Turkey, the Cyclo G6 was launched at the annual Symposium of Macular Diseases in Izmir and is now available in that country! In Jordan, Dr. Ihab Massad, the first Cyclo G6 user in Jordan, gave a popular presentation titled "No more blades, scars, or scares: MicroPulse Cyclophotocoagulation in Children" at the Congress of the Jordanian Ophthalmological Society. In Macedonia, Dr. Stela Vujosevic gave a presentation about MicroPulse at the Macedonian Ophthalmic Society Meeting in Ohrid, and in Taiwan, Prof. Paul Chew gave a talk about his observations at the Taiwanese Opthalmology Congress. The summer clearance sale ends on September 29, 2017. 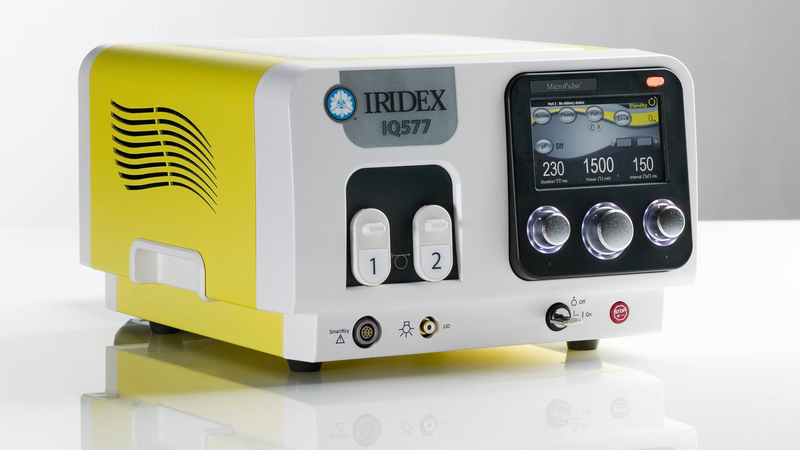 Don't miss this opportunity to purchase demo equipment, such as the IQ 577™ Laser System, at special prices. This offer is only available in the United States. FAQ: What is MicroPulse® Laser Technology? MicroPulse® Technology is a tissue-sparing solution for the treatment of retinal diseases and glaucoma. With MicroPulse, a continuous-wave laser beam is chopped into short, repetitive, low-energy pulses separated by a brief rest period that allows the tissue to cool between laser pulses. MicroPulse is a patented technology available only in IRIDEX lasers. "The MicroPulse P3's titratability, repeatability and non-incisional nature provides a unique and versatile role in the treatment of glaucoma, one that can fit many areas of the glaucoma algorithm, address many challenging case scenarios, and be tailored to meet the needs of each patient."